Compared to other visual art forms such as the drawing, the cartoon, the illustration and the comic, spanking art paintings are relatively rare. François Claudius Compte-Calix (1813-1880): The Spanking, F/m, oil on canvas. Max Ernst (1891-1976, ): The Virgin Spanking the Christ Child before Three Witnesses, surrealist oil painting, F/m, 1926 (view). 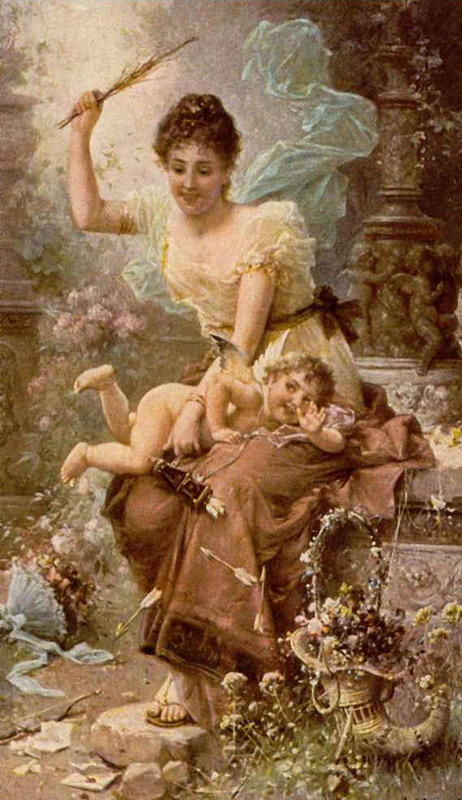 Marie-Félix-Hippolyte Lucas (1854-1925): The Punishment of Cupid, oil painting, FFF/m, 1876 (view). Felix Vallotton (1865-1925, ): Priest Punishing a Student, black-and-white, M/m (view). Pavel Osipovich Kovalevsky (1843-1903) Birching, F/m, 1880. Nikolay Alexeyevich Kasatkin (1859-1930, ): Female prisoner Sigida in convict prison, 1930. Sergei Anatolyevich Panin (1964 - ) Punishment of a clumsy maid, M/F, oil on canvas, 2000 (view), (view). Aleksey Ivanovich Grishankov "Execution", M/F, oil on canvas, 2011 (view), (view). Le doux châtiment, Adam Johan Braun (1748-1827).